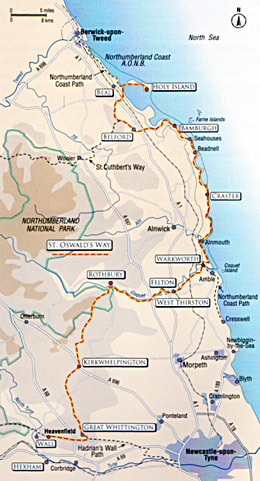 The Country short walks are circular walks based in the southern, inland part of St. Oswald’s Way and vary from 3 to 8 miles in length. Most of them are little more than a gentle stroll and give you plenty of time to enjoy the scenery, history and take in some of the local amenities. They give you the chance to see some of the beautiful landscapes and historical sites that make Northumberland special. Most of these walks follow public rights of way and other paths. There are, however, sections where country roads must be used. Please take great care when walking along roads and remember to follow the Highway Code. St. Oswald's Way is a long distance walk from Holy Island in the north of the county, through our superb countryside to Heavenfield in the south of Northumberland. For those of you who may not have the time though to tackle a whole section, or indeed the whole walk, we have created a variety of short walks. Profits from the sale of our products will be spent on the future maintenance of St. Oswald’s Way.